But how much profit do these copycat sites make for the ad giant? To ask the Chancellor of the Exchequer if he will meet Google to discuss the profits that company makes from copycat websites which charge for the tax return service and appear above government department and agency websites in search results; and if he will highlight to them the importance of taking steps to ensure that websites with the .gov.uk domain are used solely for these services. 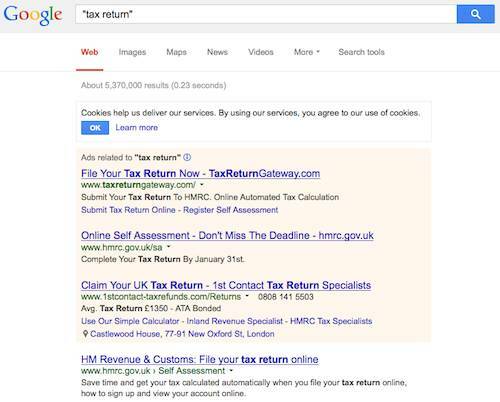 When The Register typed the term "tax returns" into Google.co.uk's search engine, we discovered that the top, sponsored (read: paid) result was one entirely independent of the official HMRC office. Instead, we were presented with a service called Tax Return Gateway, which states on its site that it is a private company registered with HMRC as tax agents. The next advertised link is one for self assessments through the HMRC website. But it is sandwiched between another outfit that claims to be "1st contact tax return specialists". Exchequer Secretary David Gauke told Davis that action would be taken to protect taxpayers from sites that are considered to be copycats of the real thing. HMRC takes customer confidence in their online services very seriously. Ministers have asked a cross-government group, which HMRC is part of, to work with Google to try and mitigate the risks posed by copycat websites to our customers. Gauke did not respond to questioning about Google's profit, however. El Reg asked the Treasury to comment on this story, but it hadn't got back to us at time of writing. We have a strict set of policies which govern what types of ads appear on Google. If we learn that an advertiser is breaching those policies, we move swiftly to take action. We are working closely with Government Digital Services [the Cabinet Office team behind the rebranding of Directgov] to ensure that ads are not misleading and offer real value. The Reg notes that Google has a "Sale of Free items and official services" policy in place that advertisers are expected to comply with. Among other things, the site has to clearly state whether it is affiliated or not with the official source - in this instance the HMRC. The website advertised on Google's results page should also disclose that the government offer similar services for free. And all of the info has to be clearly stated by the site owner above the fold on the main landing page. It's understood that Google kills ads that fail to meet its criteria.